Once the daguerreotype process was published in Paris in 1839, it spread rapidly to America. At the height of daguerreotype popularity in 1853, there were reportedly 86 studios in New York City. 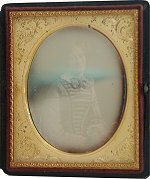 The daguerreotype is very easily detected, even by someone who has never seen one before. 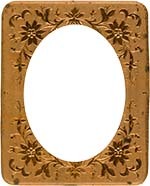 It exhibits the characteristics of a mirror at many angles. Once you have determined that your image is a 'dag', several clues can help establish a date range. Most clues are evident by just looking at the image. Some may require taking the image out of the case. This is not recommended for the amateur or skittish. 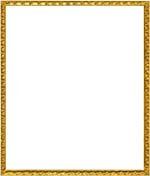 The image, case, or brass holder can be damaged easily. 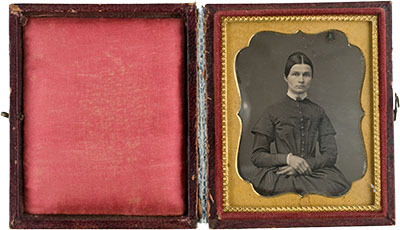 The different parts of the daguerreotype each provide date clues. So it is important you understand the different pieces. 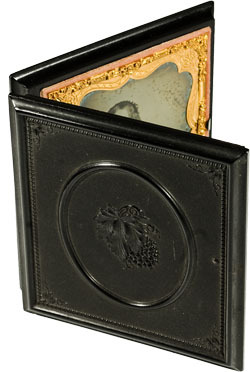 The daguerreotype was typically placed under a mat, which was covered with a piece of glass . 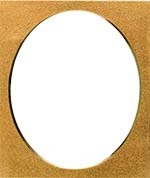 Usually the image, mat, and glass were then taped together around the edges. 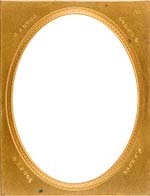 Beginning about 1847, a brass frame called a 'preserver' wrapped around the taped assembly. This complete package was then placed into a wooden or thermoplastic case for protection and presentation. 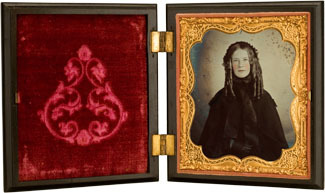 Mats give us some wonderful clues as to a daguerreotype's (and ambrotype's) original date. They changed significantly about three different times, with lesser evolutions along the way. Early mats were very simple, heavy, and coarse. The earliest ones had a 'pebble-like' texture, and were usually octagon or oval up to about 1845. About this time the finish was a little nicer, having a 'sandy' texture. Also, newer designs for the opening appeared. These included the nonpareil, acorn, elliptical, double elliptical, and some other variations. Beginning in the early 1850s, the mats became smooth, with some engraving artistry, simple at first but more complex by the late 50s. Then around 1859, the mat material became much thinner and complex designs were stamped into the metal. General Rule: The thinner mats and preservers date to late 1850s. 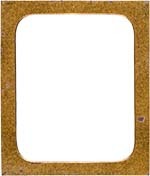 The preserver was first used around 1847, and it became a standard part of cased images. 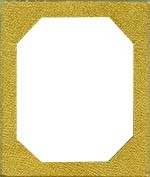 The preserver is a brass frame that wraps the glass, mat, and image. 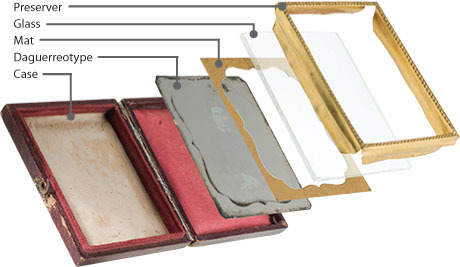 Early daguerreotypes were protected by only a mat and glass, and then placed in a case. Early preservers were fairly plain, usually adorned with simple patterns. The preserver was prone to breaking at the corners. In about 1859, preservers with reinforced corners and more elaborate artwork were introduced. General Rule: An image with a preserver dates after 1847. Early cases were usually leather-covered wood cases. They were lined with felt or sometimes silk. These were basically the only type of cases until the latter part of the 1850s. Around 1856 a new composite made from saw dust and varnish was used to create the first plastic-like cases. This material was called thermoplastic, as the mixture was heated and then formed in dies. The cases themselves were called 'union cases', not in reference to the 'Union' side of the civil war, but the union of different materials that were used in the composite. 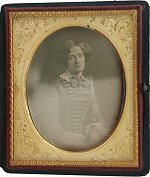 These cases are not rare, but they did not dominate the daguerreotype market, probably due to price. 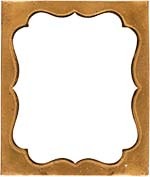 A thermoplastic case is recognized by its smooth plastic-like surface, one-piece construction (of each half) and brass hinges connecting the two halves. They are frequently broke or chipped as cases were brittle. General Rule: Thermoplastic or Union case dates after 1856. 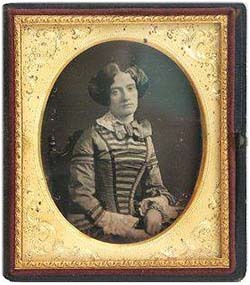 Clothes, hair styles, and personal appearance changed significantly throughout the life of the daguerreotype. The puritan-look of the early 1840s gradually gave way to some rather flamboyant styles of the late 1850s. The best way to understand is to view the wide variety of images in the gallery. 1/6 Plate - 2 5/8" x 3 1/4"
1/9 Plate - 2" x 2 1/2"
Octagon mat with pebble-like finish from early 1840s, and oval sandy finish from mid-1840s. Nonpareil mat from mid-1840s and double elliptical from about 1850. Early 1850s oval mat with etching and oval stamped mat from late 1850s with elaborate artwork. Mid-1850s Preserver, and close up of simple pattern. 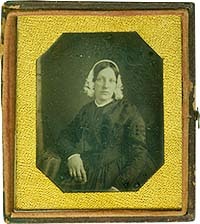 ca 1843 Daguerreotype with no preserver. c. 1860 thermoplastic case: Note smooth surfaces.